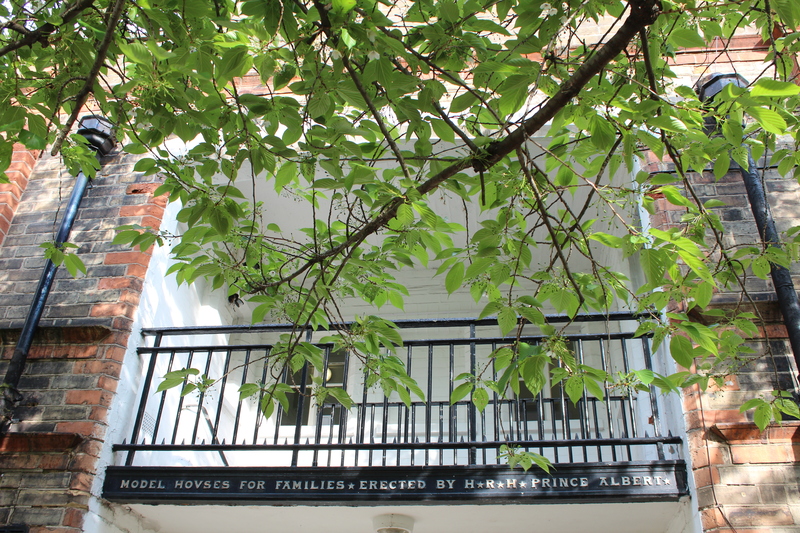 Ever wondered why there is a house in Kennington Park bearing the inscription ‘Model Houses for Families Erected by HRH Prince Albert’? This 2-storey structure was actually one of what has become known as Prince Albert’s Model Cottages or the Prince Consort Model Lodge. Built by the Society for Improving the Conditions of the Labouring Classes (SICLC) – whose name pretty much speaks for itself and of whom Prince Albert was president – for display at the 1851 Great Exhibition in Hyde Park. The cottage was placed outside of the exhibition’s Crystal Palace so that all could enter for free – and over 250,000 people did so. After the exhibition it was dismantled and re-assembled on the edge of Kennington Park in 1853. At this point, the park was yet to open to the public (after Kennington Common had been fenced off in 1852 following the massive gathering of Chartists seeking electoral reforms there in 1848), and the cottage was the only publicly accessible part. This all changed the following year, when Kennington Park became South London’s first public park in 1854. The gardens around the house were laid out in 1861. The back of the house – with the added porch. 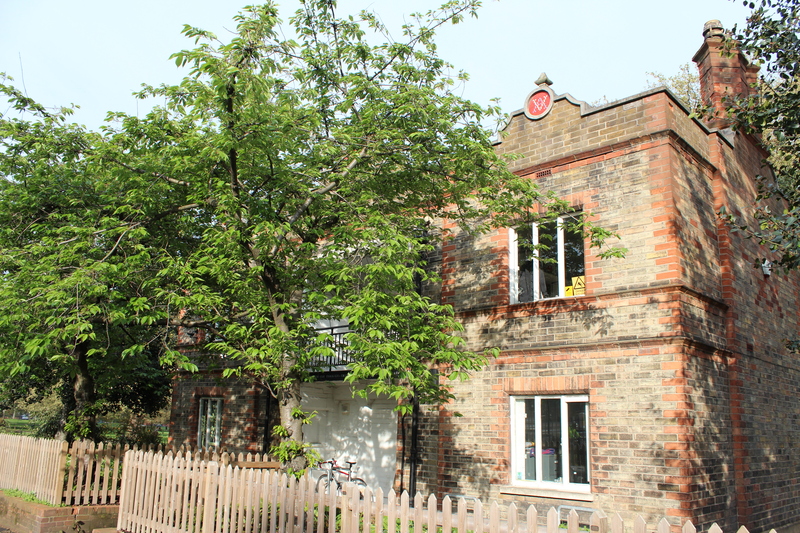 The model cottages were designed by Henry Roberts to house four families, with two flats on each level. He envisioned that the cottages would provide suitable accommodation for people from “the class of mechanical and manufacturing operatives who usually reside in towns or in their immediate vicinity”. Each family was designated a living room, kitchen/scullery, three bedrooms and a toilet – but no bathroom, as was still generally the case in houses built in the U.K. at this time. 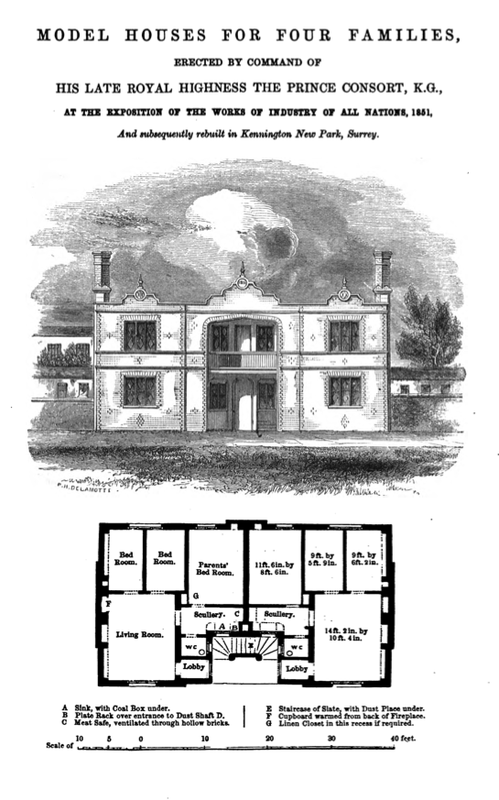 Source: ‘Plans and Suggestions for Dwellings Adapted to the Working Classes, Including the Model Houses for Families’ (London: the Society for Improving the Condition of the Labouring Classes). The open staircase provided access to the flats on the upper level – this has since been enclosed, and the doors on the left-hand side side bricked in. A porch had also been added to the back of the cottage when it was moved to Kennington. 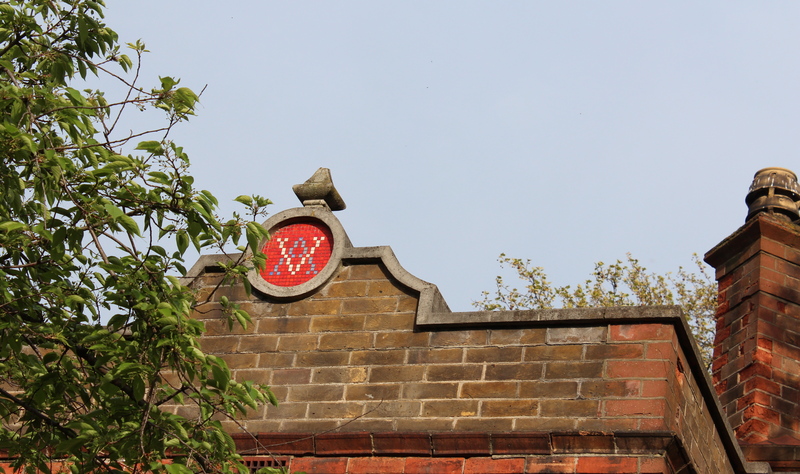 Along the front of the house, mosaic tiles on the cornices spell out Victoria and Albert’s initials intertwined (and the date 1851), whilst the brickwork on either side of the cottage also features a similar pattern. The house has been the headquarters of Trees for Cities since 2003. 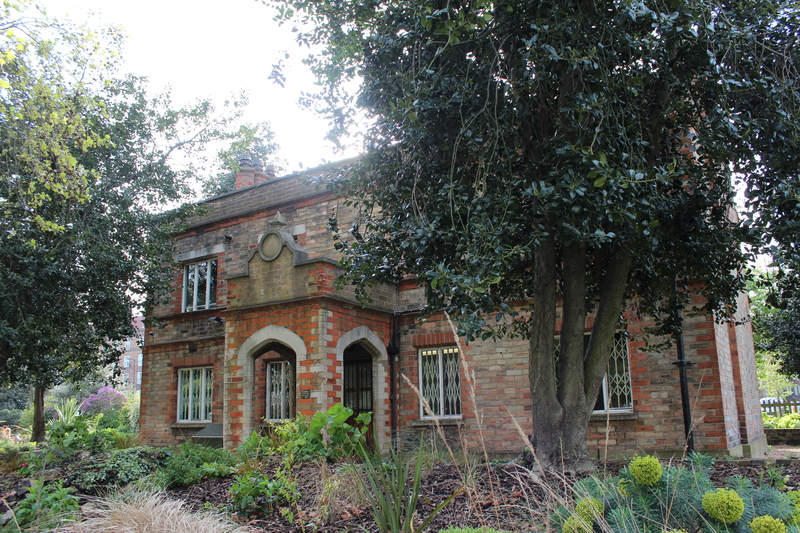 Prince Albert’s Model Cottage is located along the Kennington Park Road side of Kennington Park, between Oval and Kennington tube stations.